Only players last names will be counted (no nicknames). First and last name is fine but the last name HAS to be included. Only entries in by puck drop will be counted. If it's a 7:08 puck drop that is the last time stamp that will be accepted. If you want to change your pick you must enter your previous pick in RED and enter the new pick in YELLOW. Player modifiers will be reevaluated whenever a new manager takes over*. Players who are not listed will use the "acquisition/call-up" modifier, but must be selected by name in a pick. (Eg, the selections would have to read "Woodrow B. Smith", not "recent callup".) Same for the goaltenders. Shootout goals are worth 1 point, regardless of modifier. Game winning shootout goals are worth 2 points, regardless of modifier. 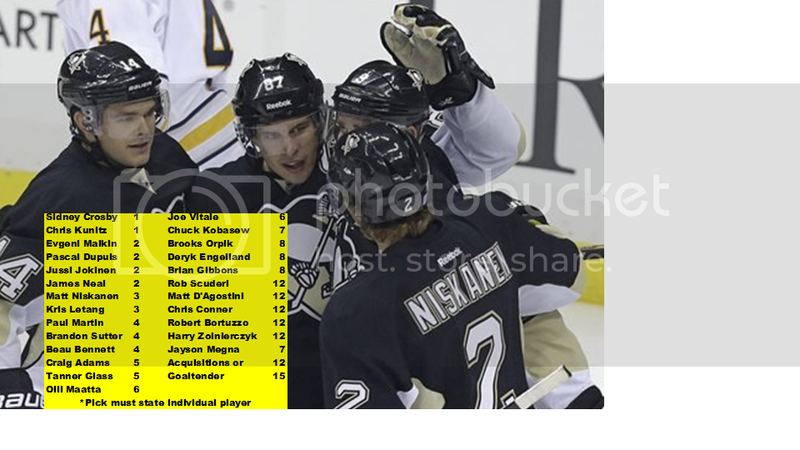 - The last Penguin conversion in a Penguin SO win is deemed to be the gamewinner, regardless of the shootout score.